Stop Paw Licking is unlike anything on the market today. Stop Paw Licking is formulated to clean the irritated paws, helping to free the area of bacteria, viruses, mold, yeast, fungi and other irritants that cause obsessive paw licking. Omega Paw has developed a product that will clean your dog’s paw from the irritants that cause obsessive paw licking. It was developed with pet’s health in mind because we care for your pet’s well-being. Stop Paw Licking is specially formulated with RemoveRx to help clean, disinfect, deodorize and sanitize your dog’s paws by targeting bacteria, viruses, mold, yeast, fungi, germs and other irritants that cause obsessive paw licking. 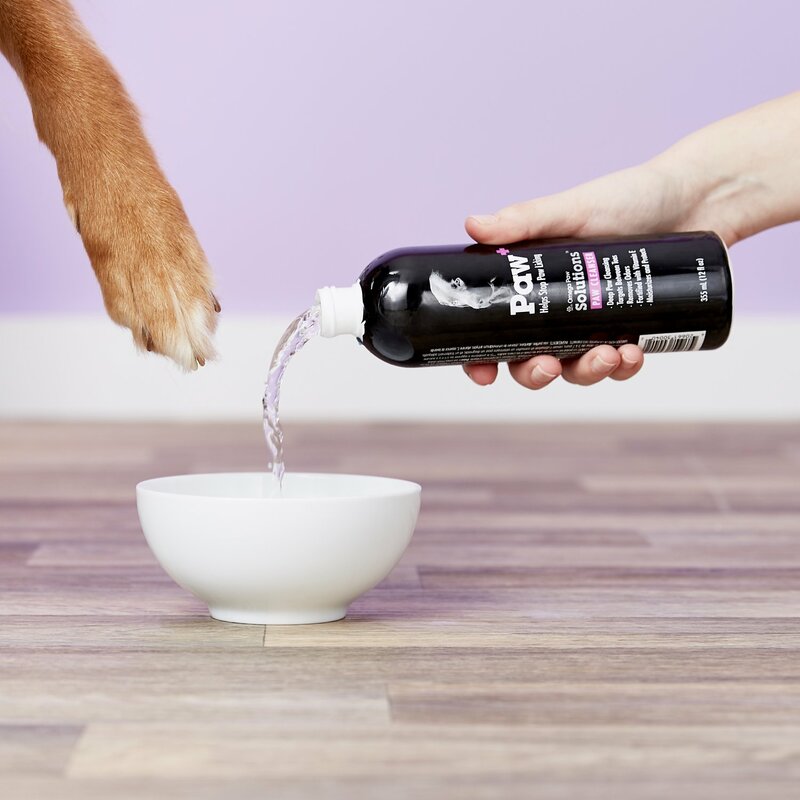 For added care, Stop Paw Licking is also formulated with a hydrating and skin softening agent to help soothe and relieve your dog’s irritated paws. Formulated to clean your dog's paws from the irritants that cause obsessive paw licking. By targeting your dog's itchy/irritated paws, it will prevent a serious condition called Lick Granuloma, which is caused by constant licking. Most powerful product available without the need of a prescription. Can be used for ongoing maintenance by applying once a week or as needed to help keep your dog's paws healthy. This product will bring soothing relief to your dog's discomfort, putting an end to the licking and biting. Fortified with vitamin E and a moisturizer to further protect the health of your dog's paws. HAZARDS TO HUMANS: Paw+ is for external animal use only and is safe for both puppies and adult dogs. Keep out of reach of children. Paw+ is a concentrated formula and MUST BE DILUTED WITH WATER. In a container big enough to fit one of your dog's paws, mix ½ cup of Paw+ with 1 ½ cups of warm water. Soak each paw in the container for 10-15 seconds then lightly pat dry. Repeat daily for 3 days. For best results do not wash your dog with soap or shampoo 3 days before or after application. It is safe for your dog to lick its paws after the application. For ongoing maintenance continue to apply once a week or as needed to help keep your dog's paws healthy. My dog constantly licks its paws. Will this help? Yes this will help. Your dog’s paws are irritated. PAW+ cleans and disinfects their paws to remove these irritants. Is it safe for my dog to lick its paws after treatment? Yes. PAW+ is made with ingredients that are non toxic and will not harm your dog. How often should I apply the treatment? We recommend you repeat daily for 5 days after which you should see an improvement. Once signs of paw licking are seen, can start the 5 day treatment. Can I reuse the same mixture for another day in order to save the solution? We would recommend using a new mixture every time in order to guarantee full effectiveness. My dog has open sores from licking too much. Is this safe to use on its paws? My 5 year old lab has developed lick granuloma. I bought this product hoping to solve the issue. It is a gentle cleanser when added to warm water it did clean his paws, and they are softer. It worked temporarily. It's not a bad product. Its not the answer . My dog would lick his feet raw At least 30mins several times a day After the 1st use he licked a bit then stopped I'm still dipping his feet to keep things under control I was very suprised how well this product works! Best $10 I've ever spent! TRIED IT ON OUR DOG. SHE LICKED AND CHEWED HERE FEET A LOT. WE FOLLOWED DIRECTIONS AND IT WORKED, BUT THIS DOG WILL NEEDED TREATED EVERY SO OFTEN. It works great. Only 3 uses in the bottle, so order at least 2 bottles so you can do the 4 th treatment a week after the last of the daily treatments. I've tried lots of things to keep my little one from licking her paws but nothing has worked. Thought I would give this a try. Did not work. Sadly, did not work for my dog. I bought two bottles of this with great hope it would benefit my dog. I followed the directions exactly and for about an hour after I began the treatment I thought it might be helping...sadly it has not helped. My dog is a 10 year old Bichon Frise female. We have struggled for years with a westi-poo that chewed and licked his feet incessantly. We have spent hundreds of dollars on vets, tests, shots, and pills. Out of frustration I put "stop paw licking" in Google, and up popped this product. It arrived on the same day as another shot and round of pills from the vet. I mixed it according to directions, and put the two cups of soultion into some Tupperware, and dunked his feet. Practically immediately I could see he had some relief. The solution has a pleasant mild scent and no color to stain. Anyway my dog and our family are happy. I just re-ordered to use as needed. Wonder why the vet couldn't find this! This problem is awesome. Sammy continuously licked his paws and withing 2 days of use, the licking has decreased. I was at my wits end with my poodle mix obsessively licking his paws. He was becoming aggressive and causing sores, we had to keep him in a cone. Even when healed, paws till looked irritated. Our new backyard has some weeds and I believe he is allergic to whatever is back there. I used this solution 3 days in a row and He seems much more comfortable! He hasn’t paid near as much attention to his paws and they do not look irritated anymore. So thankful to have found something that works! I plan to use once a week through the summer.